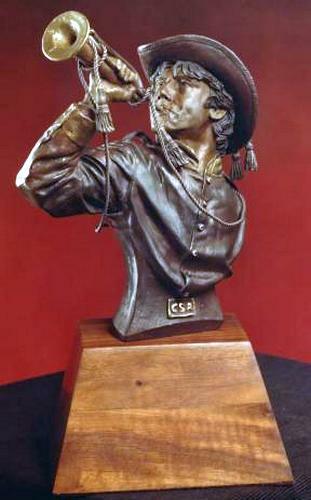 In the armies of the War between the States the bugle, or trumpet, was the key signaling device that could be best heard above the roar and din of the battlefield. Whenever possible the trumpeter, keeping always close to the commanding officer, rode a grey or light colored horse. By being thus conspicuous, the troops could find their leader wherever the trumpeter was. In the cavalry and artillery, seasoned horses knew the "calls" as well as their riders and would often go into the required formations automatically. The Bugler depicted is a Confederate. The yellow collar and cuffs on his shell jacket indicate his branch of service is the Cavalry.